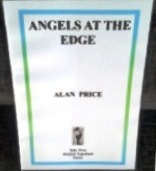 I read Alan Price’s book of poems Angels at the Edge on the train to Oban. I found it a suitable companion to my onward journey, it being both intriguing and effective in expressing its purpose in a poetic and forthright manner. I was as engrossed by his poems as I was by the articulate and evocative Scottish scenery passing my window. On reading Price’s poems, I found them deeper, more emotive and descriptive than the The Angel of History and preferred them to the poem that persuaded him to write this collection. There are nineteen page-long prose poems in the book and each one has a relatively modern and purposeful feeling in the choice of subject matter. Topics include: the final works of Richard Strauss; the now famous sculpture The Angel of the North; relatively recent disasters at Kings Cross St. Pancras tube station and Zeebruge; and the Biblical tale of Jacob struggling with an angel. So evidently, this collection has a wide ranging, quite topical and accessible subject matter, which allows the reader to engage in the poems almost immediately, which in itself is refreshing. I have selected a few poems from this diverse book to give the potential reader a flavour of this inviting and original piece of work. “Angel 12” deals with the Polish Solidarity leader Lech Walesa, whom Price names as “that six winged serpent of cunning”. He charms the “crowd” who hope “his seraph fire can burn away/ Communist practice and re-establish him, their/angel mate.” These lines sum up Price’s take on angels in this book. They are most definitely not the celestial and divine beings of the high church, but rather they are almost human, with human characteristics i.e. they are your “mate”. This down-to-earth approach makes angels even more familiar and accessible to the reader and helps to give substance to his poems. “Angel 9” is an interesting poem as it gives a little insight into the author’s personal history and mindset. Basically it is a description of Price wrestling with himself about whether to join the revolutions and protests of 1968 in “London, Paris, Berlin, Prague and Tokyo”. Like most nineteen-year-olds he is idealistic and keen to join in the action, but he is plagued with self-doubts and indecision: “what train or plane to catch,/where best to join in the protest.”. However, his determined idealism is curbed by his “cautious guardian angel” who said he “was too young to charge against/the state”. What I love about this book is the personification of angels throughout as being just like you and me. Their interaction with humans on a mundane and everyday level makes the collection highly appealing. the histories, weary of their materialism, would come to an end. Perhaps this should have been the final poem as it would be an excellent summing-up of the guiding theme throughout this book, stating that human history has been a “wreck” and it is the angels who are left to pick up the pieces. The prose style that Price has adopted. works impressively and the free flowing use of language, without the restrictions of traditional verse, allows Price to get his message across loud and clear. Like a news reader reporting on events, the language is versatile, easy to comprehend and so easy to enjoy. In conclusion Price has picked an eclectic mix of topics to illustrate and debunk the traditional view of “Angels” – he makes them ordinary with human failings and in doing so he has produced a collection to be welcomed for its style and use of language. It is definitely worth a read.